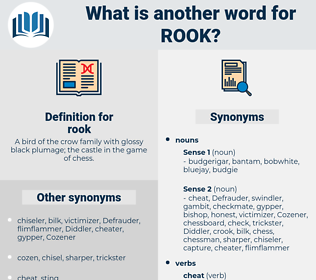 What is another word for rook? 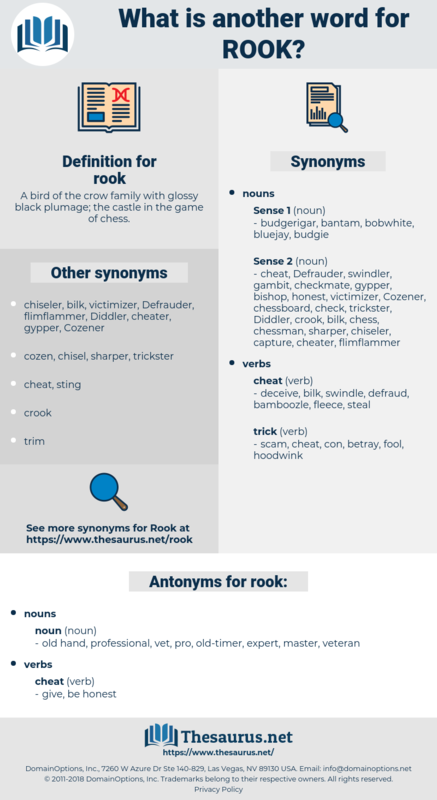 A bird of the crow family with glossy black plumage; the castle in the game of chess. old hand, professional, vet, pro, old-timer, expert, master, veteran. The rook has a most abiding affection for Walnuts. rag week, rajah, riga, rugose, recco, rush away, rush, rucksack, rickey, ruscaceae, race, roughhouse, rickshaw, ruga, rough-house, reuse, ruckus, Rus, ross sea, ruscus, rogue, rusk, rockies, rookie, rick, rose acacia, ras, rescue, rosy, reseau, rase, recess, reccy, rococo, rocky, rich, rage, rice, rig, recce, resh, reissue, rock cake, resew, roach, reassess, rehash, roccus, re-argue, res, rachis, rough-hew, riches, row house, raise, rockchuck, rissa, roughish, racy, rhesus, roseau, roux, RG, raree-show, Reyes, rousseau, rye whiskey, risque, russia, rosacea, rushy, ricksha, raj, rehouse, rouge, rioja, rework, ruck, rakish, rachischisis, rash, re-echo, rose, rosaceous, r.c., ragi, risc, reach, ragusa, rous, rooke, rouse, richea, rough, rag, Rya Rug, ragee, raja, roguish, raze, recuse, rug, raceway, razz, reek, raucous, risk, rock, ruse, rhus, rorschach, rosa, risky, rico, rejig, reich, roughage, roc, rosaceae, Rex, reggae, rye whisky, rhexia, ross, rehearse, reecho, rack, rake, rejoice, rise, rask, resize.